UPDATED: Sat., April 13, 2019, 11:05 p.m.
LOS ANGELES – A giant six-engine aircraft with the world’s longest wingspan completed what company officials called a superb initial flight over California’s Mojave Desert, bringing to life a dream held by the late Microsoft co-founder Paul G. Allen. The behemoth, twin-fuselage Stratolaunch jet lifted off from Mojave Air and Space Port shortly before 7 a.m. Saturday and climbed into the desert sky 70 miles north of Los Angeles. The jet flew 2 1/2 hours, achieving a maximum speed of 189 mph and altitudes up to 17,000 feet, the company said. The aircraft is designed to carry as many as three satellite-laden rockets at a time under the center of its enormous wing, which stretches 385 feet – a longer wingspan than any other aircraft. Powered by the same type of engines used by Boeing 747s, the aircraft is designed to take off at a maximum weight of 1.3 million pounds. 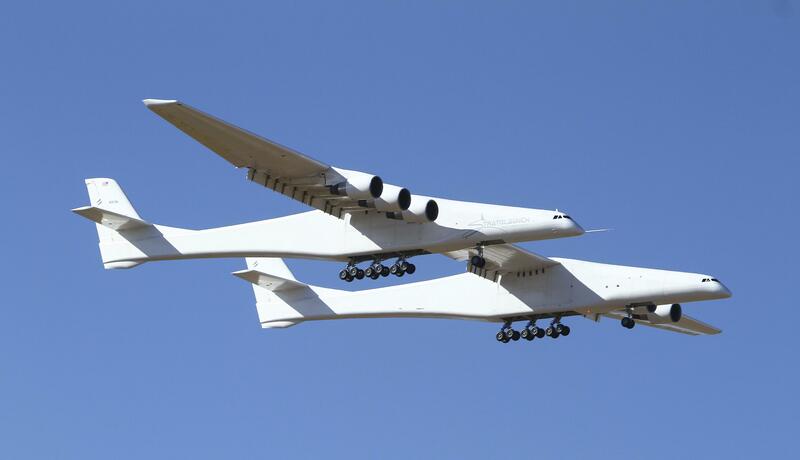 Its twin fuselages – sort of the airplane equivalent of a catamaran – are 238 feet long. The previous wingspan leader was Howard Hughes’ World War II-era eight-engine H-4 Hercules flying boat – nicknamed the Spruce Goose. Surviving in an aviation museum, it has an approximately 320-foot wingspan but is just under 219 feet long. Published: April 13, 2019, 12:24 p.m. Updated: April 13, 2019, 11:05 p.m.